To acceleration the study and following of Ho Chi Minh’s thought, ethics and style, the Party Committee and the Command of the Army Corps 4 have led and directed the agencies and units to determine the methods with the breakthrough contents, achieving practical effects. Thereby, an obvious change has been made in the work of Party building as well as staff and party members training, meeting the requirements of the missions. 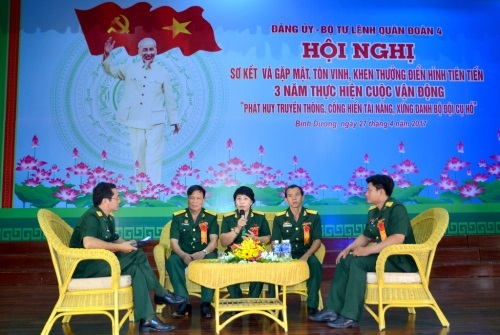 Over the past time, in order to implement the 12th Politburo's Directive No.5 -CT/TW on the promotion of studying and following Ho Chi Minh’s ideology, ethics and style, the Corps’ Party Committee and Command have led and directed its subordinate units to concretize the contents of the Directive into resolutions, action plans and regular activities of each party committee and party cell, turning it into daily deed and the sacred feelings of cadres and soldiers to beloved Uncle Ho. Thereby, that contributes to improving the leadership capacity, the fighting power of the party committees and organizations, the roles and responsibilities of commanders at all levels and the quality of cadres and party members of the Corps. At the same time, that is also considered as a key political and spiritual motive to build strong and pure Corps Party Committee and comprehensively strong unit. Besides the achieved outcomes, the propaganda and education activities have yet to be regular and continuous. Their contents and forms are not really diversified. The implementation of some agencies and units still exposes confusion and inappropriateness; even a small number of cadres, party members are not really voluntary in following and studying the Uncle Ho’s style and ethics. In order to overcome the above limitations, and to a practical change in the implementation of the Directive, the Corps Party Committee and Command have focused on their leadership and direction while adopting a number of synchronous solutions, particularly to renewing the methods and selecting the breakthroughs. First of all, the Corps has concentrated on strengthening the comprehensive leadership capacity, the fighting power of the party committees and organizations at all levels, especially at the party cell level. Grasping Uncle Ho’s teachings “party cells serve as the root of the Party among the masses. The better party cells are, the better all the Party’s policies are implemented”, the Corps Party Committee and Command have led and directed the subordinate party committees at all levels to strictly maintain and follow the principle of Party’s leadership and discipline; and to actively renew the content as well as to continuously improve the quality of the party meetings in accordance with the Guideline 497/HD-CT by the General Department of Politics. Party committees at all levels have enhanced the professional training and organized the contests of "good Party cell secretary" and "good Party Committee secretary" to improve the quality of Party building work as well as the leadership and working styles of secretaries and party committee members. Together with improving the quality of developing leadership resolutions and holding party meetings, the Corps Party Committee has instructed party committees at all levels to attach importance to concretizing the Directive No.5 and incorporating its contents into regular leadership and meeting contents of each party organization. For party meetings, the principle of democratic centralism should be respected while self-criticism and criticism must be honest and objective. Measures have been promptly taken to prevent and overcome the degeneration manifestations of political ideology, ethics, lifestyle, "self-evolution" and "self-transformation" within the Corps. It is also considered as an important content in the implementation of the Directive No.5 within the whole Corps. To do this, in the coming time, the Corps will focus on improving the quality of the party members. Accordingly, in addition to the management and education of the party organizations, agencies and units within the Corps promote the self-effort of each party member. The results of studying and following Ho Chi Minh's thought, ethics and styles have been taken as one of the criteria for commending, evaluating and classifying organizations, party members, and the masses on a yearly basis. Secondly, focus has been placed on building staff of cadres to meet the task requirements. In his work "Modifying the working style", President Ho Chi Minh affirmed that "the success or failure of every work depends on cadres". Thoroughly understanding Uncle Ho’s teachings, the Corps Party Committee has concretized the higher echelon’s guidance on cadre work into its resolutions, directives, and plans. Accordingly, it determines the process of the cadre work and the criteria defined with specific contents and requirements for each level and each subject of cadre, ensuring the standardization of quantity and quality. It clearly defines the competence and responsibility of each level, especially the democracy and publicity in the evaluation, consideration, training, fostering and planning, and the personnel arrangement and utilization, creating consensus and synchronization during their implementation. At the same time, the importance is also attached to the grasp, education, and the enhancement of the awareness and responsibilities of the party committees at all levels, creating a high level of consensus among cadres and party members, especially party committees and cadres in charge, and overcoming the manifestations of subjectivity, simplicity, sensitivity, and partiality in the cadre work. In order to well perform the cadre evaluation and consideration work, the Corps Party Committee requires the party committees at all levels to carry out it strictly according to their gradation and comprehensively from moral virtue, political spirit to the professional ability and practical capacity grounding on the units’ levels of task accomplishment and assigned responsibilities performance. The cadre training work is implemented by subordinate agencies and units through various synchronous measures as evidenced by the combination between the training and fostering and the planning and arrangement of utilization, as well as the cooperation between sending cadres to academies and schools for studying and in-service training. With the motto that to provide further training for weak aspects and new contents, importance is attached to the improvement of professional skills serving for training tasks and combat readiness. In order to create young and talented cadre staff, the Corps performs cadre rotation work to help the staff to strive, to train and to quickly self-improve. Moreover, the work of planning, arranging and using the contingent of cadres is carried out in accordance with strict, objective and democratic procedures to ensure the appointment of comrades who are deserving in both quality and capacity, "both red and expert", thereby, promoting personal ability which accords with each position, and earning the mass credibility. This is the key content, which motivates the implementation of the political task of the unit in general and the implementation of the Directive No.5 in particular. Thus, in the cadre planning, the Corps Party Committee instructs each subordinate party committee to meet the "mobile and open" requirements as evidenced by the fact that a position is determined through multiple sources and by three levels of age. The priority of the planning is given to young cadres, but the quality as well as the inheritance and succession among generations must be assured. At the same time, the appointment and adjustment of the titles of cadres should be done in a reasonable manner while the full arrangement of commanders from platoon level to battalion level in full-strength and combat readiness units must be prioritized. Senior campaign officers, who are over appointment age, are proactively and reasonably disposed to promote their professional capabilities and experience. In addition, the Corps well implements the regulations and policies on the army life and rear, creating favourable conditions for its cadres to work. Thirdly, to promote the pioneering and exemplary role of the cadres and party members, especially those in charge at all levels. According to President Ho Chi Minh, the exemplariness of cadres and party members greatly affects the public education: "a living example is worth more than a hundred speeches". Thoroughly grasping that, the Corps Party Committee requests the cadres and party members, especially the leading cadres to be truly exemplary in their work, morality and lifestyles, and to strive themselves to be "diligent, economical, incorruptible, truthful, and public-spirited and selfless” to become an example for the inferiors and the masses to study and follow. At the same time, the practice of matching words with actions, and strictly obeying what the party members are forbidden to do should be expressed in work as well as in daily life. 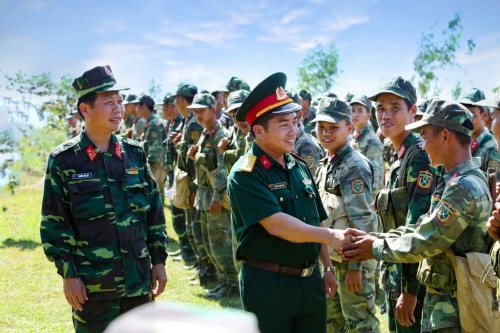 Over the past time, the reality has showed that the efficiency of the exemplariness has been multiplied as the cadres and party members have worked in close cooperation and shared "joys and sorrow” with their subordinates and soldiers. In the coming time, the Corps determines to better monitor the implementation of the motto "Four togethers" (eating, living, working, sharing together) with the soldiers, especially at the platoon and company levels under various educational and management measures of the party organizations and the efforts of the cadres and party members. This is one of the very important contents that creates the bond, solidarity and unification between officers and soldiers within the unit, and between party members as well as the masses and party organizations, contributing to improving the overall quality and combat strength, building the revolutionary, regular, elite, and gradually modern Corps, meeting the requirements of the tasks in the new situation.